Guangzhou BRT's Gangding Station. Photo by Benjamin. 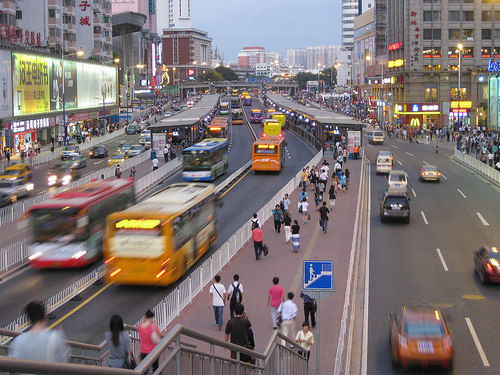 The city of Guangzhou, China today won the 2011 Sustainable Transport Award for its new world-class bus rapid transit (BRT) system that integrates with bike lanes, bike share and metro stations. The annual award created by the Institute for Transportation and Development Policy goes to a city that made the most progress over the year to increase mobility, while reducing transportation greenhouse and air pollution emissions and improving safety and access for cyclists and pedestrians. Hildago also recognized the city of Leon, Mexico, one of the nominees, which is home to Mexico’s first bus rapid transit system. Leon was celebrated for its unsurpassed level of integration, with 69 out of 100 public bus routes physically integrated with the city’s Optibus BRT system. For more information, photos, and videos about the award and a list of past winners, visit www.st-award.org. Philips Livable Cities Award: Vote Now!